Hi, book blogging friends! I wanted to make this guide on a hot new release, A Thousand Beginnings and Endings edited by Ellen Oh and Elise Chapman. I look forward to finding this book in my local library, and when I do, I’d love to read-along with some bookworm buddies. If you wanna have a fun discussion, continue reading. Wait, what book are we reading? Do you enjoy folklore retellings? Which fairytale retellings do you find exhausted and over-represented? Was there any particular author that drove you to read this anthology? What are your opinions on YA Anthologies; are they well written, or are they disappointing? How well did you find the South-East Asian folklore represented in A Thousand Beginnings and Endings? Do any of the short-stories remind you of other books (can you recommend any)? Do any of these short-stories inspire you to travel to south-east Asia? If this anthology could be adapted into a TV mini-series, who would you dream to be cast? Who was your favourite couple/romance? Which short-story was your favourite? Do you agree with any of these reviewers? Tasya (The Literary Huntress) rated the book an overall 5/5 stars, but found some still fell into ” cheesy-Asian-trope-with-the-hair-streak,“. Danielle (Life of a Literary Nerd) rated the book 4/5 stars, claiming it was unforgettable and an urgent read for any YA fan. 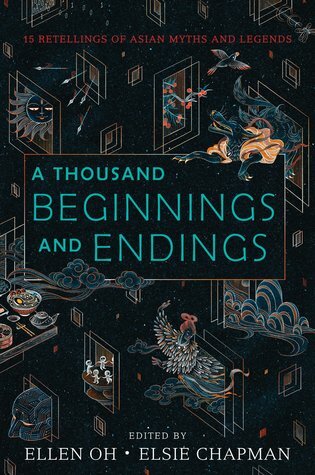 Ren (A Bookish Balance) rated A Thousand Beginnings and Endings with 3/5 stars, purely because the book alluded to classic romantic retellings, but found the delivery too modern and misleading. Kayla (BooksandLala) rated this 4/5 stars but was disappointed by Renée Ahdieh‘s short story, Nothing Into All. Of all the reviews I’ve read, Kayla is the only one who has reported a low rating from Ahdieh’s contribution. Have you read this book? Is it on your TBR? Tell me your thoughts on A Thousand Beginnings and Endings below.